Robert Thompson reported that at 7:30 a.m. this morning two folks met by accident at the corner of Broad and Esplanade. Please slow down, the life you save may be your own. Much of the threat to pedestrians comes from speeding cars. Fortunately, you’ve got plenty of ways to encourage drivers to slow down. Take action! Spread the word. Neighborhood websites, e-newsletters, Facebook Pages and twitter are all great ways to reach out. Use yard signs to remind drivers to slow down. Pick up signs at DRIVE LIKE YOUR KIDS LIVE HERE — or use plywood or laminated poster-board to create your own. Keep it simple. Short messages and big letters work best. Set the pace. Driving at or below the speed limit forces others to do the same. Park your car in the street, and ask your neighbors to do the same. Narrow travel lanes prompt drivers to slow down. Install radar signs that show drivers how fast they’re going. Reduce speed limits. If the speed limit where you live is over 30 mph, ask transportation agencies to change it. Take back your street. Walk, ride a bicycle, sit on the front porch — and put some toys in your front yard. Reminding motorists that streets are for people encourages them to slow down. Bump outs like this one make crossing the street safer for pedestrians. And, in the middle of the street is a brick section with a gradual rise on either side. This helps slow traffic. 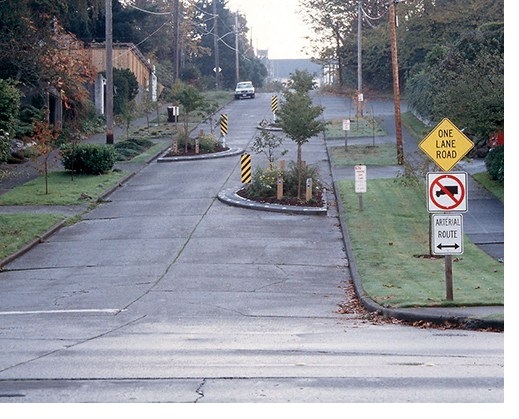 TRAFFIC CALMING HAS SWEPT THE WORLD over the past 20 years. It’s based on the rather simple idea that cars and trucks don’t have exclusive ownership of our streets. 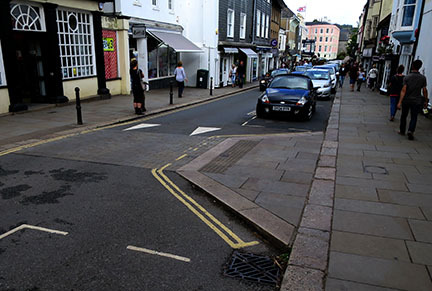 Streets are shared public space also belonging to people on foot and bicycles, in baby strollers and wheelchairs. Reminding motorists of this fact, traffic calming uses design features such as narrowing roads or elevating crosswalks to slow traffic and assert pedestrian’s right to cross the street. This idea has altered the literal landscape of urban life in the Netherlands, Scandinavia, Germany and Australia as people move about their cities with more ease and pleasure—and it’s now taking off in other parts of the world. THE ORIGINS OF THIS INGENIOUS IDEA CAN BE TRACED TO DELFT, NETHERLANDS, where residents of one neighborhood were fed up with cars racing along their streets, endangering children, pets and peace of mind. One evening they decided to do something about it by dragging old couches, planters and other objects out into the roadway and positioning them in such a way that cars could pass but would have to slow down. Police soon arrived on the scene and had to admit that this project, although clearly illegal, was a really good idea. Soon, the city itself was installing similar measures called woonerfs (Dutch for “living yards”) on streets plagued by unruly motorists. One can only imagine the response of city officials if these neighbors had meekly come to city hall to propose the idea of partially blocking the streets; they would have been hooted right out of the building. But by taking direct action, they saved their neighborhood and changed the face of cities around the world. On Saturday, November 19, 2016, neighbors turned out in numbers to make the City Beautiful Club’s Capdevielle Green and Clean Day a real success. Litter pickup, leaf raking, weeding and trimming, and gutter clean outs were just some things done. An impressive project managed and executed by neighbor Pushpa has also resulted in planting the next installment of the Esplanade liriope border. Another great achievement was the conversion of the center bed “crater” into a presentable mound ready for a spring planting. 10 yards of soil, bales of pine straw, and 20-30 garbage bags were among things used that were purchased with donated funds from neighbors. Beverages and snacks were in part provided by our new neighborhood restaurant on Gentilly Blvd, TOAST. It was the people power that made the real magic. About 25-30 people came by and helped or supported the action in some way. My joy was that the collection of individuals included folks from all walks of life, all age groups, and all economic classes. It is important to note participation by staff and residents of our neighbors at Odyssey House. Sharing a love of the public space as a commonality was especially uplifting. NOLA Parks for All had a couple of board members down in the dirt with us as part of their support and encouragement of our grass root efforts. On the horizon – can we reach a consensus on what the important center circle bed should be? Can we convince Park and Parkways to let us do it? Here’s a shot of the flurry of activity from young and old as Pushpa harnesses the raw power of our volunteers! 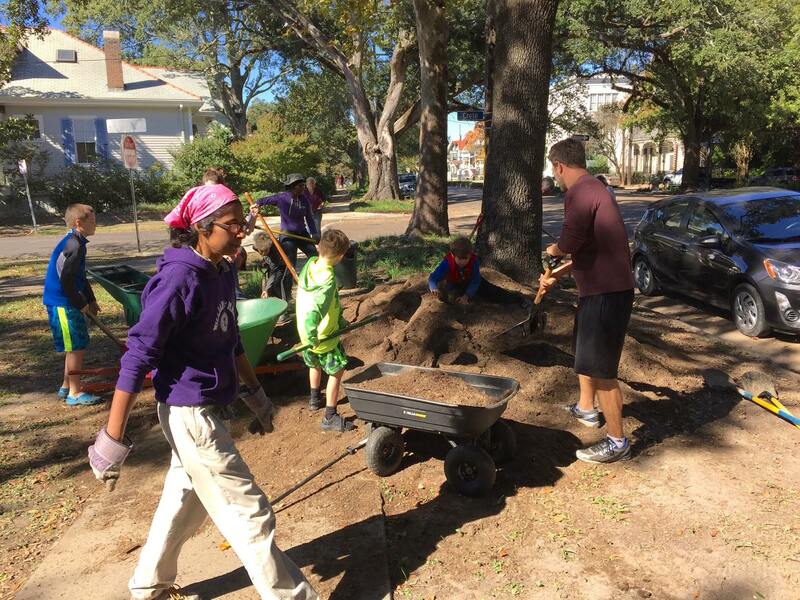 Rickie Lee Jones was working with other Faubourg St. John neighbors to help beautify the neighborhood on Saturday, November 19, 2016. In the video above, learn why she lives in New Orleans. On October 18, 2016, Capdevielle Park received attention from the crews at Parks & Parkways. Diseased trees were removed, others trimmed and thanks to a large backhoe, a large step toward rehabbing the center mound for new plantings took place. All this support from the City means we need to double down on our commitment to restore the central circular bed in Capdevielle Park. 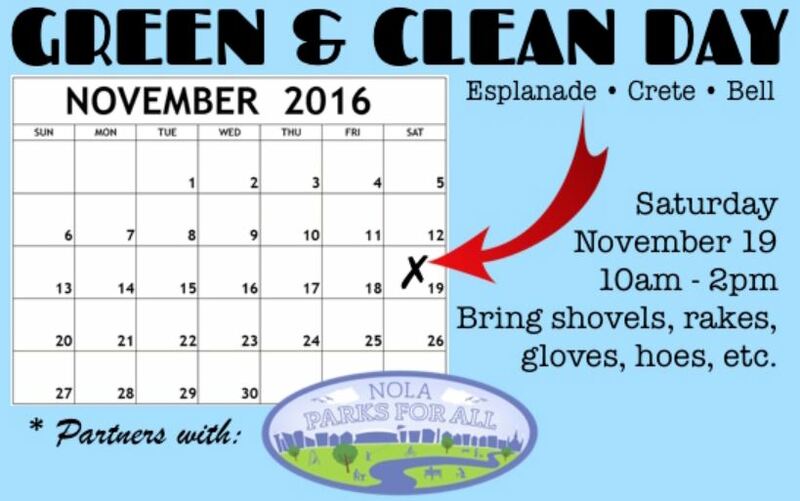 On Saturday, November 19th, please bring shovels and rakes, gloves, and muscles so that we can clean up the soil and prepare this bed for greater things to come. Headed toward our second Capdevielle Place (or Park) improvement action. Your help in the past has qualified you to receive more begging appeals from me! Seriously, I and others have appreciated the commitments you have made to improve our little neglected park at Crete and Esplanade. I think we are slowly making a difference and are on the way to a much improved public space, one we can proudly claim for our special community. At the moment we only have a couple of hundred dollars collected. I would like to continue plantings on the periphery begun by Pushpa last meet. Additionally, we have a special gift from Tammany Baumgarten (http://www.baumgardens.com/) of a garden plan for the bed closest to N Broad. More dollars will mean more plants to execute these goals. Large donors seeking tax deduction should contact NOLA Parks For All (a 501c3 http://www.nolaparksforall.org/contact-us.html) who is partnering with us at this time to support citizen actions related to park improvements. The bulk of the work however is good ole fashioned labor. Litter removal, gutter cleaning, trimming and weeding, bed preparations – all driven by personpower. I have stockpiled pine straw for bed dressing. So please distribute this information in the notice below to interested parties, and respond if you can think auxiliary activities, provide refreshments or have appropriate plant material to donate. Hope to see you that Saturday, Nov 19 (10a-2p). Paul Capdevielle, the forty-second Mayor was of French descent. He was born in New Orleans, January 15, 1842. His father, Augustin Capdevielle, was born in France, but settled in New Orleans in 1825, becoming a prominent merchant in the commission business and active in politics. It was from his father’s interest in politics that young Paul inherited his interest in governmental affairs. His mother, Virginia Bertrand, was born in New Orleans in 1816.Paul Capdevielle was educated at the Jesuit’s College in New Orleans from which he was graduated in 1861. He served with credit in the War between the States, enlisting in the New Orleans Guard Regiment of Infantry, but in 1862 joined Boone’s Louisiana Artillery, and was wounded at Port Hudson. After the close of the war he returned to civil life, taking up the first employment that offered itself, studied law in April 1868 was graduated from Louisiana State University. In 1892, he gave up law to accept the presidency of the Merchant’s Insurance Company. He served as its President for sixteen years, until it was liquidated and sold. His political history began in 1877 when he was appointed to the School Board. Later he was a member of the Orleans Levee Board, a Commissioner of Prisons and Asylums and Chairman of the Finance Committee of the drainage commission. Mr. Capdevielle was an outstanding figure in Louisiana politics from the time of his election as Mayor of New Orleans in 1899. He was appointed auditor of Public Accounts in 1904, and re-elected three times, and held this office up to the time of his death. He survived the political storms attending the fall of the state administrations, the last in 1920, when Governor Parker was swept into office. The Flower administration was a turning point in the history of New Orleans. It closed one epoch and opened another. With it began the period of commercial prosperity which extends into the present time. Mayor Capdevielle’s administration was noted for two events, both inseparably connected with the beginning of New Orleans’ industrial development; the installation of the modern sewerage system and the organization of the Public Belt Railroad. The Board of Port Commissioners also began to function actively during this period. City Park stands as a monument to his energy and civic spirit. The upbuilding of the park was his constant care, and he served continuously as President of the City Park Improvement Association for more than two decades, holding the office at the time of his death. The new administration went into office May 9, 1900, at the beginning of the twentieth century when a wave of prosperity passed over the country and was felt in New Orleans. Mayor Capdevielle in his inaugural address spoke of the drainage system about to be constructed and stated if the city desired to have its own electric light plant it could do so without great additional cost by using the power house of the drainage system. The contract to erect a modern jail, to be called the House of Detention, was awarded for $112,800 and the site of the old Marine Hospital, on Tulane Avenue and Broad Street, was selected. The Clay statue, being in the way of safe operations of the street cars, was removed from Canal Street to the Lafayette Square on January 12, 1901. The consolidation of various street railways into one corporation under the name of the New Orleans Railways Company was an important factor of the years 1901-1902. On May 1, 1901, New Orleans was honored by the visit of the President of the United States, William McKinley, accompanied by Mrs. McKinley and Secretaries John Hay, Charles Emory Smith, and E. A. Hitchcock. He was received in the Cabildo by the Governor of Louisiana, attended by his staff in full uniform. The bells of the Cathedral of St. Louis announced the arrival of the President and his cabinet, escorted by Mayor Paul Capdevielle, and a committee of distinguished citizens. As the cortege entered the Supreme Court Hall, Chairman Zacharie announced in a loud voice “The President,” and the assembly arose and remained standing while the Chief Justice conducted the President to a seat of honor at his right on the Supreme Court Bench. The Governor of Louisiana took a seat on the left of the Chief Justice, and the Mayor of New Orleans the one on the right of the President, the Justices occupying seats immediately in the rear of the bench. Chairman Zacharie then conducted the members of the cabinet and their wives to places on the left of the dais, where a seat, filled with roses, had been reserved for Mrs. William McKinley, who, at the last moment, was too ill to attend. In 1873, Paul Capdevielle married in New Orleans, Miss Emma Larue, who died several years ago. Three sons and two daughters blessed this union; the sons are Christian, Auguste and Paul, Jr., and the daughters are the Misses Edith and Yvonne Capdevielle. Paul Capdevielle was found dead at his home in Bay St. Louis, Mississippi, August 13, 1922. 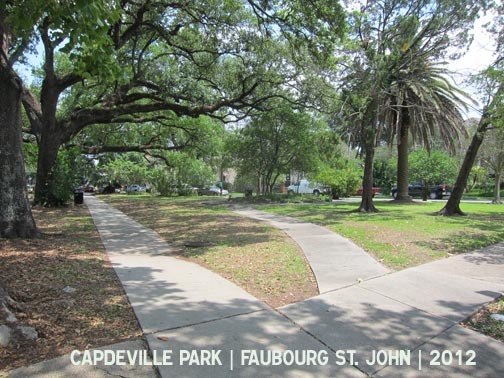 It’s been a long hot summer since our last get together at Capdeville Park. The progress begun at that Clean-up day has begun to give the park that “cared for” look which in turn lifts our neighborhood, discourages further littering and vandalism, and may even make our area safer. During the summer, I sought some help from professionals who can guide us in our next phase of park uplifting – no sense spending our small resources of time and money on anything that doesn’t have the best long term success rates. A good plants person can steer us toward appropriate choices in selecting items for our park beds. I approached Greater New Orleans Master Gardeners program looking for assistance. Their group consists of persons who completed training from a LSU Agcenter outreach program and who give some of their time in community service. I haven’t yet found a Master from the area willing to take this project on, but a very valuable contact was made through this connection. 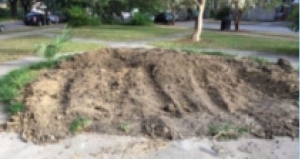 Tammany Baumgarten, a professional horticulturist from BaumGardens Landscape & Design, is a major resource for Master Gardeners, and in response to my begging she graciously provided me with a plan and a strategy for the planted beds in the park. 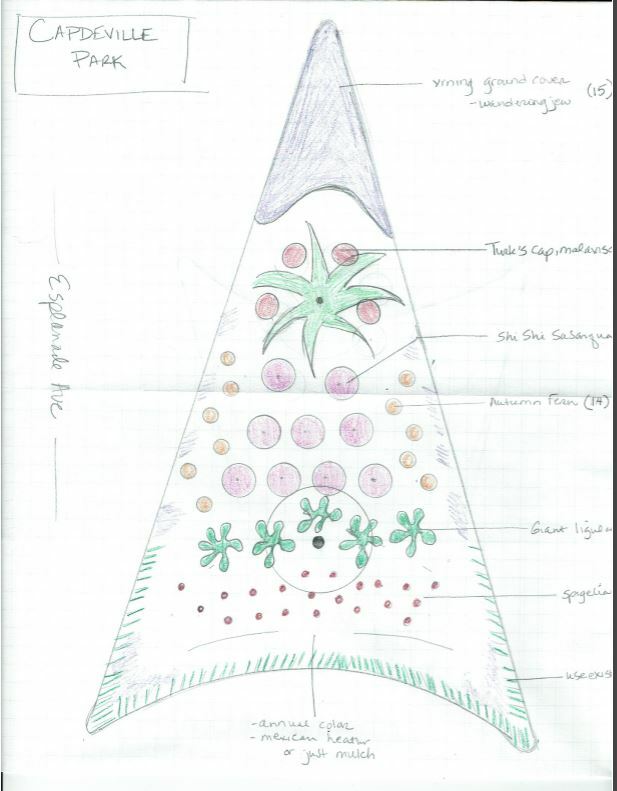 Below is her drawing, which I am also sending to our friend Tica H. at Parkways, for your comments (and Parkways approval). The price tag for the venture, if fully planted straight away would be about $1700 in materials. Labor was assessed at $1400. 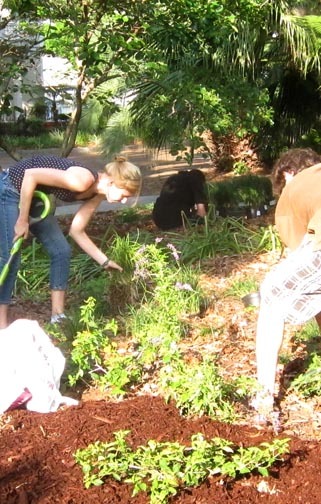 Of course we are a volunteer effort, and some plant materials and supplies may be scrounged, and much of the labor should be our own sweat equity. A November time frame is being targeted for our next volunteer effort. Bed clean-up and prep, some planting and landscaping – this will be determined by our practical limitations and what we can raise in funds. I am also working to find us an organization to be a part of where fundraising can include business solicitations and grants. But for the moment the burden is on us. Please review the plan below. If you are able to commit to a donation toward its achievement, please contact me at the info below. 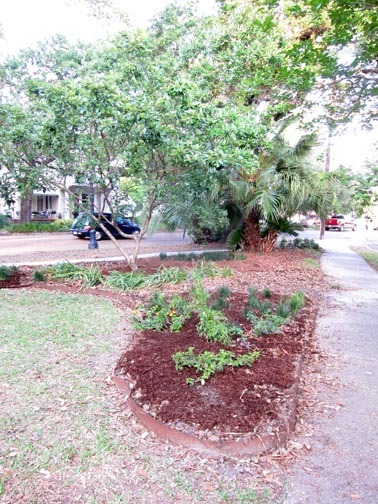 Thanks neighbor for caring about our community and beautifying New Orleans! 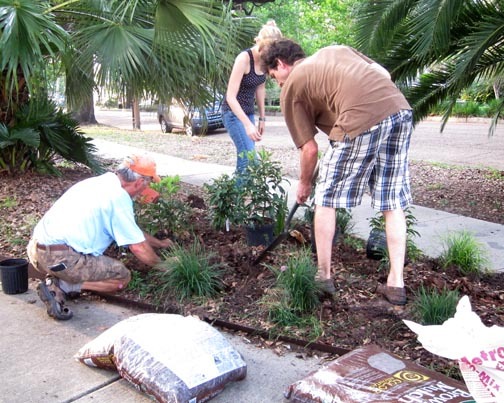 Neighbors got together in 2012 to help make some improvements in Capdeville Park. 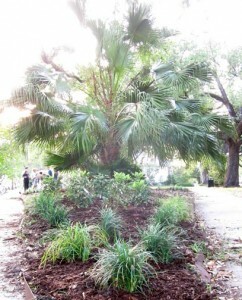 Robert Thompson would like to once again add some plant life in Capdeville Park. 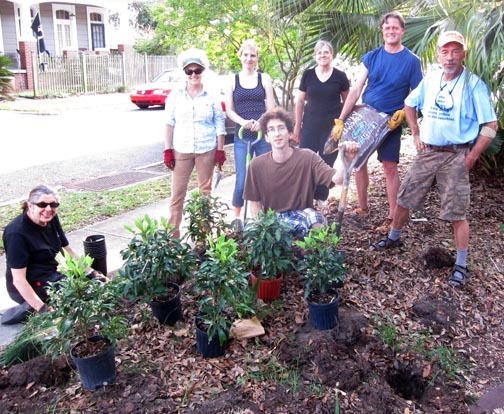 Thanks to 8 neighbors that spent time in 2012 to divide and plant 48 gallon sized Monkey Grass, yellow lantana and purple duranta (to bring in butterflies), and ardesia crenata (Christmas berry, a shade lover). We mulched, amended soil, divided Paper Whites to replant this fall, and trimmed 5 Natchez Crape Mytles that we planted maybe a dozen years ago. $500 went quickly from 5 trips to 3 Home Depots! Unfortunately 10 bags of soil and 6 bags of mulch disappeared into a white pickup. I had too many loads of stuff to manage in a Subaru and left it out at the park the nite before, gone at 6:30 am. I vented my disgust by hoeing weeds vigorously! Neighbors report frequent plant thefts near Broad. We replaced what we really needed, and will wait to augment soil in another phase. Future needs include a streetlight (way to dark here),repair some crumbling interior sidewalk, sprinkler system, a creative welcome to FSJ sign, sculpture. These are LONG term dreams. Very open to input and help make the connections. I do better with my hands in the dirt!! 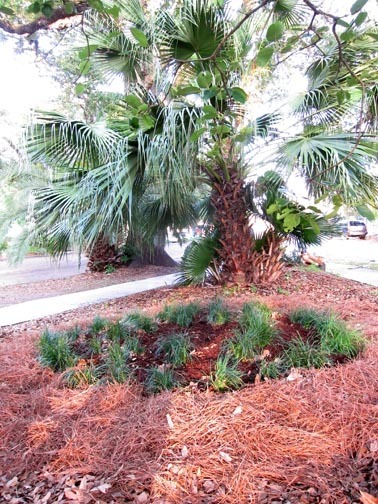 I will be asking Parks and Parkways to remove a phoenix palm growing at the base of an oak. New Orleans, La. 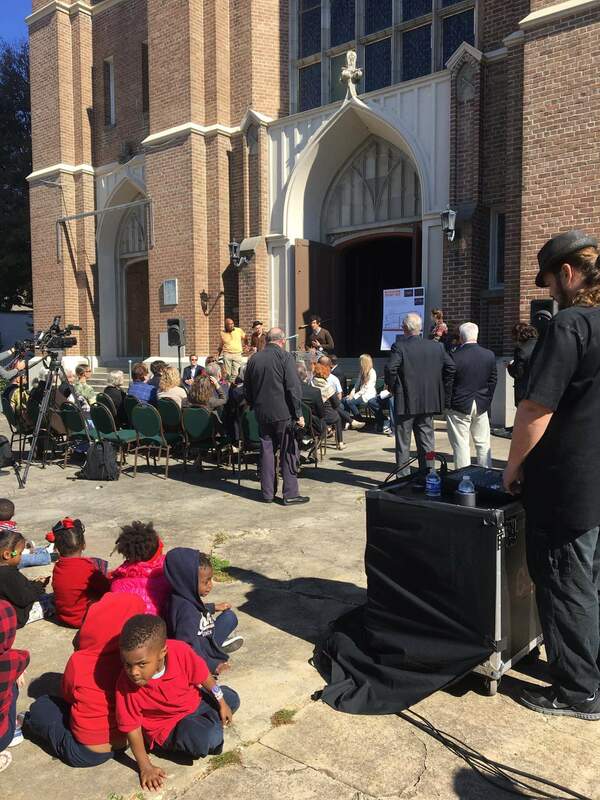 (February 18th, 2016) – Today, Southern Rep Theatre, Rose Community Development Corporation and Alembic Community Development announced plans for launching the Bayou Tremé Center campus development project, which will renovate the long-vacant former St Rose de Lima Church into a hub for the performing arts in the city and a cultural anchor on the Bayou Road corridor. The ceremony was followed by guided tours through the historic building and around the site of the upcoming campus development. 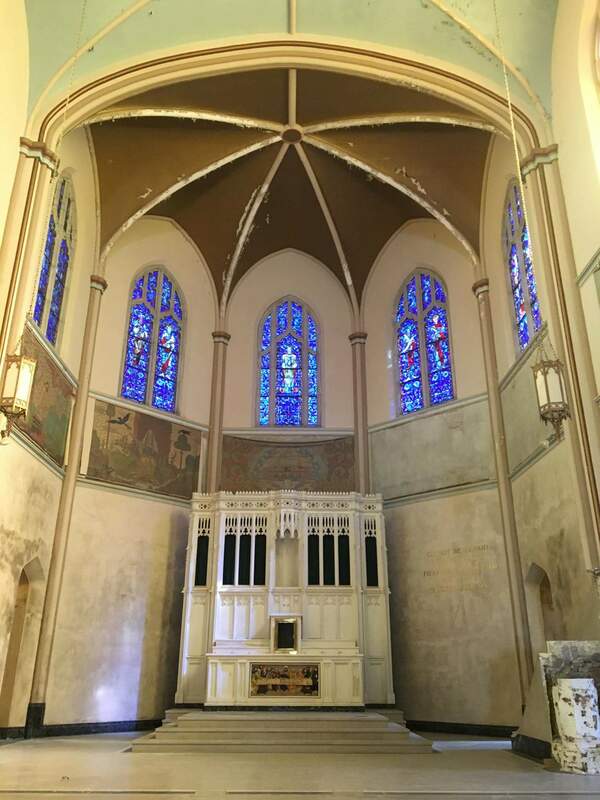 Originally constructed in 1915 to replace a 19th century structure that was lost to a fire, the iconic Gothic Tudor church operated for 90 years before being closed by the Archdiocese of New Orleans in the aftermath of Hurricane Katrina. Rose CDC and Alembic will jointly own the 47,000 square foot campus, which includes the church building and two former Catholic schoolhouses directly across Columbus Street, and will work to redevelop the properties into an arts and education campus that supports the ongoing revitalization of Bayou Road and serves as a hub for the performing arts industry throughout the city. The project partners anticipate that construction will begin in 2017, with a projected opening date in 2018. 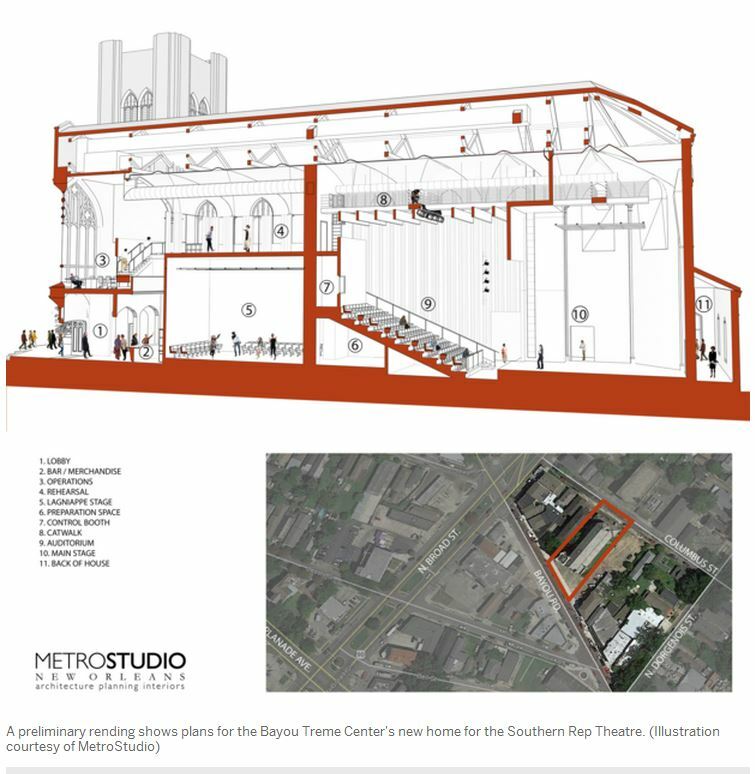 The centerpiece of the Bayou Tremé Center campus will be a 13,400 square foot theater complex operated by Southern Rep Theatre, New Orleans’ premiere theatre company. The theater complex includes a 125-seat Mainstage proscenium, a 65-seat Lagniappe Stage convertible to a cabaret or black box configuration, an Outdoor Stage for pre-performance activities, administrative offices, rehearsal room, and a bar/café. In addition, the Bayou Tremé Center campus will include the renovation of the 23,000 square-foot schoolhouse at 2539 Columbus Street into a new space for a school operator, while the 11,000 square-foot schoolhouse at 2533 Columbus Street is planned as office space. For more information about the project, please contact Jenny Windstrup by phone: 504-523-9857 or by email: jwindstrup@southernrep.com, or Jonathan Leit by phone: 504-569-0014 or by email: jleit@alembiccommunity.com. Founded in 1986, Southern Rep Theatre’s mission is to develop and produce new plays that reflect the diversity of New Orleans, to provide its audience with professional theatre of the highest artistic quality and achievement, and to establish a creative working environment that nurtures theatre professionals. As the city’s premiere nonprofit professional theatre, Southern Rep strives to use the artistry of theatre to enlighten, educate, and entertain audiences, and to further extend that service through educational and outreach programs. 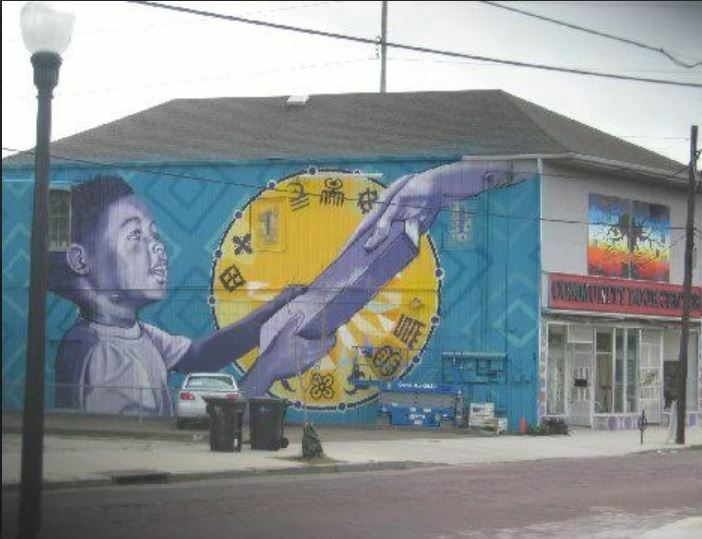 Rose Community Development Corporation is a nonprofit community development corporation founded to rejuvenate the Bayou Road neighborhood, with an initial focus to realize the vision for the Bayou Tremé Center. Alembic Community Development invests in long-term partnerships in underserved neighborhoods through real estate development and organizational capacity building. Through its offices in New Orleans and New York City, Alembic has developed a range of mixed-use properties in collaboration with mission-driven partners, including affordable and supportive housing and commercial and community spaces. Neighborhood businesses offering special programming enrich our community by creating diverse and interesting activities within walking distance. For instance, Kitchen Witch at 1452 Broad hosts booksignings where new books and their authors are showcased, a great opportunity for those of us who appreciate the New Orleans literary scene! On Saturday Jan 16 from 2-4 pm, food and travel writer Beth D’Addono will be signing her new book, “The Hunt – New Orleans”. 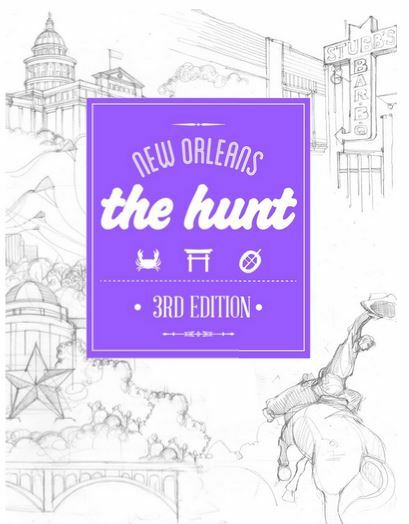 If your interest is in this city and its lifestyle experiences then you may want to check out “The Hunt”, a travel guide in the series from Gatehouse Publishing that focuses on an eclectic mix of independently owned dining and shopping destinations. D’Addono, who fell in love with New Orleans and started writing about the city in 1991, is now based in the Marigny and writes regularly about New Orleans for outlets including USAToday.com/10Best, Southbound, Country Roads, and AAA World. “Kitchen Witch is one of the more than 40 independently owned businesses I feature in my book,” she said. “New Orleans isn’t about chain stores, and this wonderfully funky cook and book shop is one of my favorite spots. Its expanded new location has room for all kinds of treasures and there’s plenty of parking,” I hope she didn’t miss the fact its located next to the best neighborhood in the city in which to live! Japanese travelogue features cats in New Orleans. The first 8 1/2 minutes is on Bayou Rd near Broad. Faubourg St. John neighbors Debbie Lindsey and Philipe LaMancusa opened their store at 1452 N. Broad, suite C, today (November 1, 2015). “Kitchen WItch Cookbooks” will undoubtedly become an asset to our area, as a unique and quirky bookshop run by two lovely people. Debbie is planning to be open 7 days a week, 10ish to 4ish and will feature book signings and related events. It is in the little strip mall like building with the Boost Store and the Beauty Supply. Plenty of parking, but heck I can just walk there. We haven’t had a neighborhood hangout with the feel of special books since Maple Street left, and cooks will obviously find a wide selection of cookbooks. 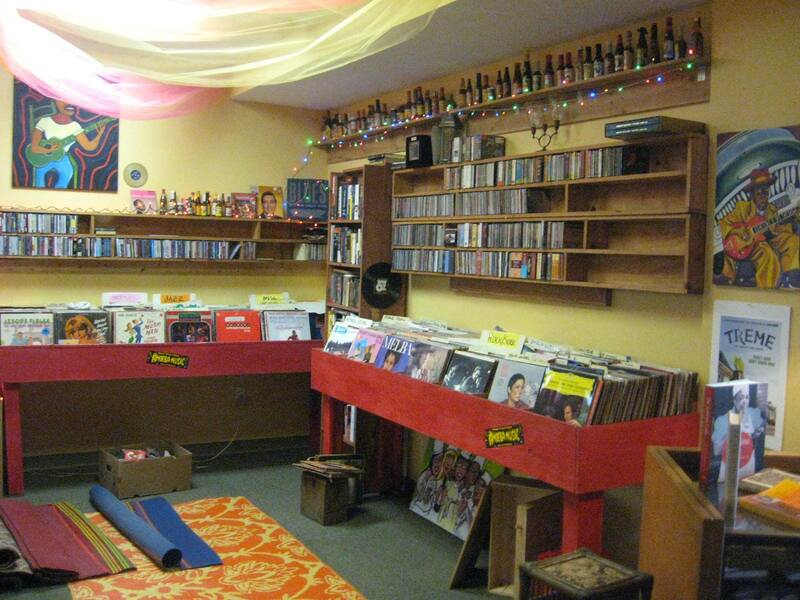 I love the esoteric treasures hanging around, and there’s also vinyl records for music lovers. The place is still settling in, creative chaos I’d call it, but I was so excited to visit I couldn’t wait longer. Hope this appeals to our membership and we can support still another great Faubourg St. John business. 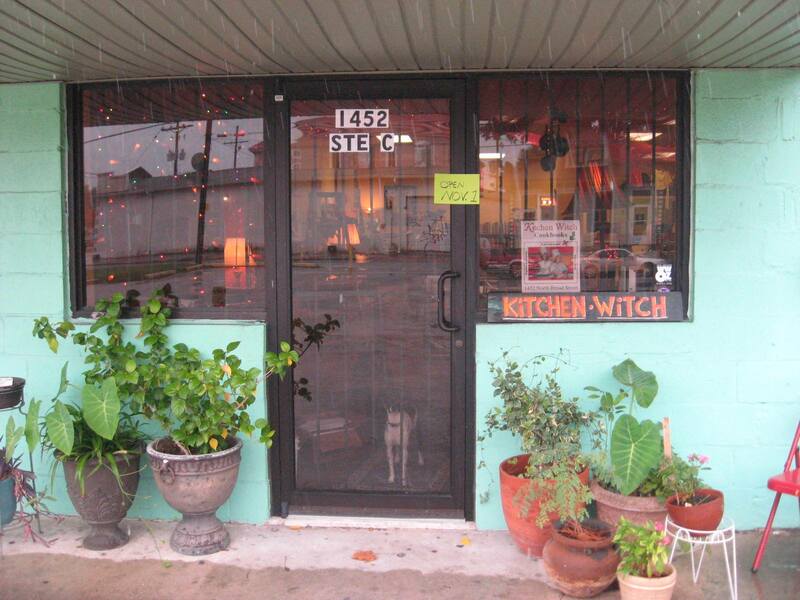 Kitchen Witch Cookbooks is a small book shop at 1452 North Broad in New Orleans. They specialize in rare, hard to find, out of print and pre-owned books on food and cooking. This is a fully functional independent book store and not just a website location. You will always find Debbie or Philipe at the shop ready to answer questions, share secrets, relay gossip, political opinions and give you directions to the hottest spots to eat. The shop’s phone number is 504-528-8382 and they’ll gladly take and execute telephone purchases. They will happily ship your purchases, and all out of state shippings save the 9% taxes that we must extract from in-shop clients. They do ship ‘Media Mail’ and that takes seven to ten days from time of departure. Debbie Lindsey and Philipe LaMancusa (the two person operating team) look forward to your visit, either in person or by phone/email/spirit/carrier pigeon. They are full of advice on dining and other visitor concerns and are very friendly. In fact, let them know when your birthday is and they will send you a card! StayLocal is kicking off the local holiday shopping season New Orleans style with a Second Line on November 28th! We’ll dance our way to four trailblazing businesses on historic Bayou Road and Shop Small Santa will be handing out treats. Bring your mom n’ dem! StayLocal is kicking off the local holiday shopping season New Orleans style with a Second Line on November 28th! Join Broad Community Connections, WWOZ 90.7 FM, our Stay Local krewe and Soul Brass Band as we dance our way to four trailblazing businesses on historic Bayou Road. Plus, Brandan “BMike” Odums, the artist behind Exhibit Be, will unveil his latest piece honoring community roots and local businesses. Bring your mom n’ dem! Community Book Center, and Pagoda Cafe! StayLocal Members, doing anything special for Small Business Saturday? Fill out this brief form and we’ll post it here and on our Twitter.This offer is just for StayLocal members. Please email Charlotte at charlotte@staylocal.org with any questions. All over New Orleans, local businesses are celebrating Small Business Saturday with amazing deals and events. Soava – free domestic shipping on ALL products!Source – Mention “Small Business Saturday” to get 10% off your entire purchase! Miette – Buy locally made gifts, take selfies with extraordinary hand-crafted float art, and meet the artists behind Mardi Gras! Mint – Say “Small Business Saturday” to get 20% off full-price clothing, shoes, jewelry & home decor. Garden District Book Shop – Book & tote giveaways and a gift certificate raffle! Buy 3 massage gift cards & receive a gift card for a mini facial! Buy 3 pedicure gift cards & receive a gift card for a manicure! Buy 3 facial gift cards & receive a gift card for a 30 minute massage! ZukaBaby (Uptown and Metairie) – Take holiday photos with Green Santa & enjoy tea and cookies. Judy at the Rink – Receive 20% off any one item. Plus, personalized gifts by master laser engraver, Leonard Williams. Magic Box Toys – Say “MAGIC” to receive 10% off your purchase. Free coffee, donuts & gift wrap! Sucre – Post a photo of you & your Sucré with the hashtag #sucresmallbiz to be entered to win a 15 piece holiday macaron collection! Tubby and Coo’s – 10% off everything in the store and show a receipt from another local biz & get 15% off. Plus, “Buy 2, Get 1 Free” board games! Bloomin’ Deals – 50% off of the entire store!!! Shop locally and sustainably! Octavia Books – 14 local authors will be in store signing their books. A great personalized gift! Feet First (Uptown) – Trunk shows by Porter Lyons and Kismet Cosmetics, Complimentary wine, 2x rewards on frequent shopper cards, & makeup touchups by local makeup artist Midori. Feet First (Metairie) – Complimentary wine, 2x rewards on frequent shopper cards, a book signing by Ashley Merlin, and 2 trunk shows. 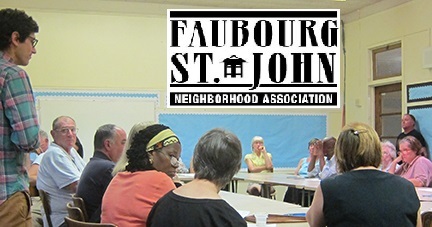 At the August 4th, 2015 Faubourg St. John Neighborhood Association meeting, Jeff Schwartz of Broad Community Connections talked about the need for healthy food options along Broad. The property diagonally across from the ReFresh Project— at Broad and Bienville, on the far/Lake side of the intersection–is currently five vacant lots, covering 20,000 square feet in a C-1A district with an Inner City Urban Corridor overlay that provides for design review and renders fast food and gas stations conditional uses. 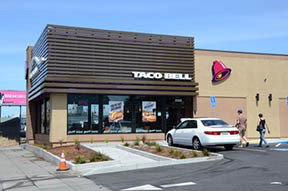 The current owner has proposed a Taco Bell at the site. The proposed hours of operation are shown below. Future Land Use: This site is slated to become an AC/EC MU-1 district, with the intent of creating mixtures of uses with arts and cultural uses and pedestrian-friendly amenities. View the proposed plans here. City Councilwoman Susan Guidry said she will begin studying ways for the city to make the growing Fourth of July festivities on Bayou St. John go more smoothly for attendees, and also announced that the City Council has formed a new committee on bicycle safety following the latest death of a bicyclist. 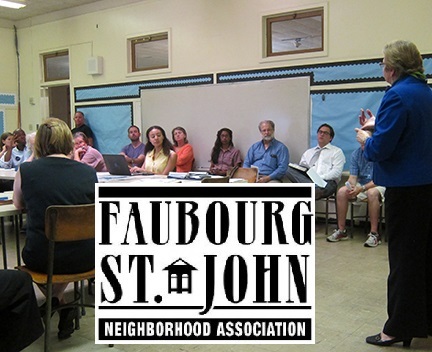 “We have now put together a Pedestrian and Bicycle Safety Advisory Committee,” Council member Susan Guidry said at the Faubourg St. John Neighborhood Association meeting on Tuesday. Guidry said that as serving on the Transportation Committee for City Council, she held a meeting about laws pertaining to the roads and bicyclists. “I did an entire transportation committee meeting about a year ago on the rules of the roads, bicyclists and motorists and it was pretty thorough, we went through all the state laws, all the ordinances,” Guidry said. According to Guidry the Pedestrian and Bicycle Safety Advisory Committee will be compromised of members from organizations such as Bike Easy, an organization dedicated to bicycling and transportation access issues, and the Advocacy Center, focused on offering services to seniors and citizens with disabilities. Guidry also mentioned that members from the University of New Orleans will also be on the committee for collecting data. “We thought about everyone that should be on that committee and we’re going to be looking at safety for bicycles, pedestrians, and of course motorists,” Guidry said. Guidry said that the growth of bicycle lanes around the city has happened at a fast pace, but there are still areas that need improvement. “Our bicycle lanes, the number of miles have grown so quickly, and yet there are places like the Broad Street overpass where it’s really not safe,” Guidry said. Gudiry said she thinks it is exciting that many people are biking around the city, but many still need to be educated on the biking rules as she mentioned that there are bikers who bike on the wrong side of the road. Guidry urged both bikers and drivers to be aware of each other on the road. “It’s your red light as well as motorists’ red light,” Guidry said. Guidry also mentioned that she will be talking with city officials about Bayou St. John being a “destination spot” for the 4th of July and the Krewe of Kolososs boat parade. “The Krewe of Kolossos, I know that there were a lot of people who enjoyed it, but also there were a lot of issues as a result of it,” Guidry said. Guidry said that many people have picnicked along the Bayou this year and in previous years while waiting to see the parade in the evening. “That is something that the Krewe doesn’t feel like they can be responsible for and understandably, it is just a general public coming out,” she said. Guidry said that she is meeting with city officials next week to discuss plans to make the area a better spot for the festivities. “I don’t think there is any going back from there, you can’t shoo people off and do what you want to and we need to determine how we’re going to deal with it because there needs to be port-a-lets out there and there needs to be sanitation and pick up,” Guidry said. Guidry also announced that the Historic District Landmarks Commission and the Human Relations Commission will hold two public meetings this month to discuss the removal of the four Confederate statues (Robert E. Lee statue, Jefferson Davis statue, PGT Beauregard Equestrian statue and the Battle of Liberty Place Monument Confederate statue). According to Guidry the HDLC meeting will take place at 1 p.m. and the Human Relations Commission meeting will take place at 6 p.m. on August 13th in the City Council Chambers. Once the meetings take place, each organization will make a recommendation to the Council and then the Council will made a final decision. “I really think that it was meant to be a conversation to lead to reconciliation,” Guidry said. Tuesday, September 1st at 7 p.m.